Within the war-torn country of Afghanistan, honey is treated as a renown cure-all. However, for some inside those borders, the profitable commodity also creates incredible opportunities for working and owning private businesses, even for young women. 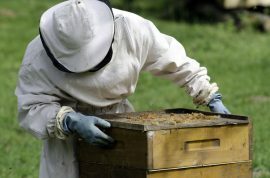 One example is 19-year-old Frozan, who three years prior received a loan, purchased two bee hives, and was educated in apiculture thanks to Hand-in-Hand International, which is a nongovernmental organization with a focus on poverty. Ever since the Taliban fell back in December of 2001, the status and lives of the women of Afghanistan have significantly improved, but insecurity, traditions, and the recent decline of international donations have slowed down progress. According to a report from Human Rights Watch, government officials say that over 80 percent of the 3.5 million kids who don’t attend school are female, with less than 40 percent of teen girls being able to read compared to teen boys at 66 percent. While the data regarding Afghanistan’s honey industry is hard to come by, cited government officials and local media say honey production within the country has increased in the past few years, hitting around 2,000 tons back in 2015. Admittedly, current industry constraints mean a lot of the country’s honey won’t leave Afghanistan, but the honey industry’s level of growth in so short a span of time is still a positive sign for Frozan and other local beekeepers.